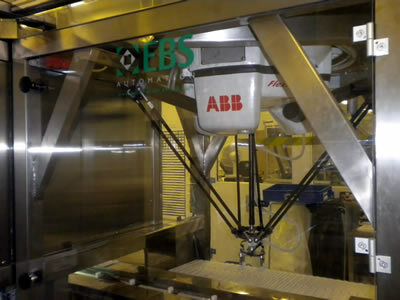 EBS Automation was commissioned to design and build a pick and place production cell which would pick a large sachet containing pharmaceutical powder and place it in to a flow wrapper pocketed conveyor and then pick and place a small sachet containing a second part of the pharmaceutical powder and place it on top of the large sachet whilst the pocketed conveyor was running. In its self not difficult but at a production rate of 1 sachet every 0.64 seconds a challenge to add to the challenge the production cell had to cater for 14 different types of country package artwork and had to be integrated in to an existing line during a limited shut down period. The project was achieved by integrating two ABB Flexpicker robots, a servo driven sachet cassette loading system and 3 independent camera vision systems into a clean room environment. The large sachets are fed from a sachet filling machine along a flexlink conveyor to the first robot cell where the sachet is viewed by the vision system, the image is compared to ensure the art work on the sachet is correct and the orientation of the sachet is stored and communicated to robot. The robot will adjust its gripper position to ensure that it picks the sachet up correctly by using the stored image orientation. The picked sachet is then placed into the moving flow wrapper pocketed conveyor. The small sachets are loaded in to 4 product quick change cassettes which index to the pick area, at the pick area each sachet art work is checked by the two additional vision systems and the sachet is then picked by the second robot and placed directly on top of the previously placed large sachet.